Park Farm Pumas Red Under 12s remain on course for a trophy double after progressing to the last four of the Hunts Cup on Sunday. 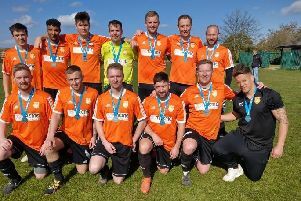 The unbeaten Division Two table-toppers came from a goal down to beat Warboys Colts and progress to the semi-finals. Alfie Howarth fired them level in the second half to force a penalty shoot-out and Park Farm won that 3-2. In Under 12 Division One, there were wins for the top two. Leaders Deeping Blue beat Feeder Soccer 3-0 with goals by Freddie Brooks, Billy Zyberi and Daniel Tarver while Yaxley Blue overcame Riverside Rovers by the same scoreline. Deeping have a two-point advantage but Yaxley have three games in hand. It was also a good day for the Deeping Blue Under 13 team. They won 4-2 at home to Division One pacesetters Netherton Hawks through goals by Ethan Young (2), Jack Brumfield and Trafford Crane to preserve their unbeaten record. Also undefeated are Baston. They beat Stamford 5-1 with Keelan Walker grabbing a hat-trick and Harvey Davis and Oliver Tooth also on target.